WMU-Cooley Law School students were gripped listening to Sacred Beginnings Founder and Executive Director Leslie King tell her life story about how she, a human trafficking survivor, was able to transform her life after over 20 years of being exploited, addicted, and trapped. The WMU-Cooley Lunch & Learn education program called Addiction and Human Trafficking was held at WMU-Cooley on Wednesday, June 14. WMU-Cooley law students, in conjunction with the American Bar Association Student Division, hosted the event. 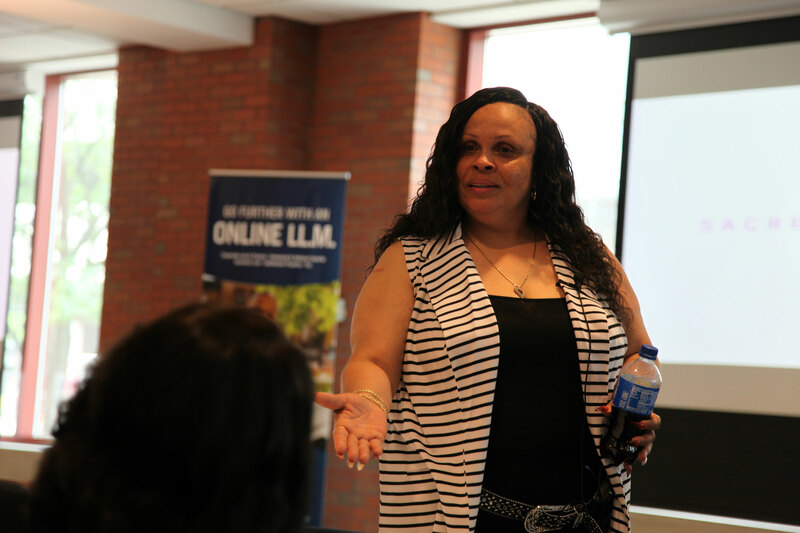 Sacred Beginnings Founder Leslie King tells WMU-Cooley law students her life story of being exploited, addicted, and trapped, until she found the courage to turn her life around. WMU-Cooley law student and event organizer Nakita Haynes was grateful to have Ms. King come to WMU-Cooley’s Lansing campus to speak. King talked about the struggles she had endured, until she found the strength and courage in 2000 to break free and commit her life to rescuing and rehabilitating women just like her. Today Leslie is an award-winning and sought-after expert, speaker, and trainer. In conjunction with her mission at Sacred Beginnings, she works alongside law enforcement and legislators to affect lasting change. Read Ms. King’s story HERE.